Doyles Room is an online poker room on the Cake Poker Network and also offers and online casino, called Doyles Casino. Doyle Brunson is a 10 times champion at the WSOP and this is Brunson's home on the internet. This site hosts decent poker tournaments and juicy cash games at low and mid stakes. Doyles Room offers a $550 Welcome Bonus and welcomes players from the U.S and different places around the world. Many players look into the matter of promotions and bonuses before selecting a particular site. When played properly, promotions may be used to the benefit of the player. New players at the Doyles Room may take advantage of a 110% bonus on a first deposit, up to the amount of $550. Just use Doyles Room Bonus Code PNB550 for the $550 bonus. This is a great way to start off. Doyles Room hosts a range of exciting poker promotions in order to enhance the enjoyment of its customers, such as a thrilling beat the Brunson 10 challenge and Doyle’s $50,000 Bounty Tournament. Tournaments make up a big part of the poker action at Doyles Room. Various types of tournaments are available at this site, such as sit n goes, satellites, speed tournaments and multi table tournaments (MTTs). This site boasts a selection of guaranteed tournaments and a monthly tournament with the guaranteed prize pool of $250,000. Doyle Brunson has assembled a handful of successful online poker players and calls the ‘The Brunson 10’. The team will consist of ten players handpicked by Doyle Brunson. There are currently 6 spots filled on the Brunson 10 and they are on the lookout for the remaining 4 players. Perhaps it could be you? Everyone who plays at DoylesRoom has a chance to win a spot. Doyles Room is a great location for poker lovers as it offers a selection of just about every type of poker one could imagine. The choice ranges from Omaha to stud games and Razz and horse. It almost goes without saying that you will find the popular Limit Hold’Em game here. 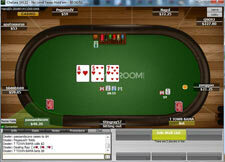 Doyles Room presents a fun chat option enabling gamers to chat with other online players in the poker community. Tutorials are available at this site, offering useful poker related information such as game rules and tips. Doyles Room offers various payment alternatives. The simplest and quickest option for use at this site is either Visa or MasterCard. Other options are available such as Neteller, Moneybookers and ewalletxpress. Customer support is an important element at any online gaming site especially where money is involved. Gamers often have queries whether they relate to matters such as the games at the site or to issues such as financial transactions. Doyles Room offers a live chat service that is available 24 hours a day. Customer support at this site may also be obtained by telephone. In addition, there is an FAQ section that offers information on different topics.